Not all projects are created equal. Some are fundamentally flawed, and they usually display at least one of these warning signs. 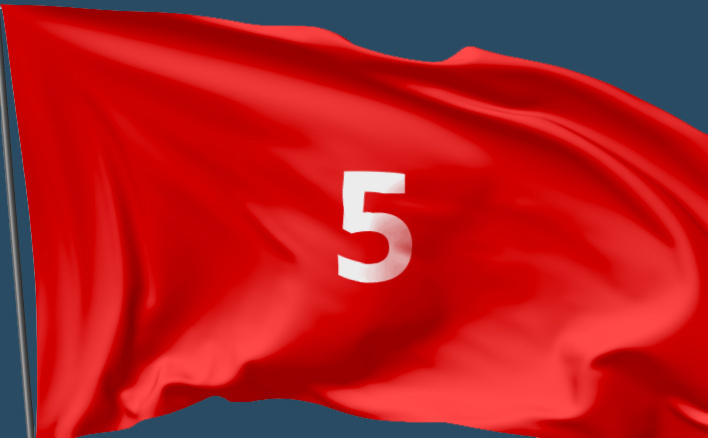 If you can spot any of these five red flags early enough, you'll be better prepared to stamp them out, or avoid managing a doomed project altogether. It’s easy for project managers to fixate on the schedules, budget and resources. The problem is, a project can be on time and under budget while out of line with the outcome. In other words, the project should be beneficial to the business’s overall goals. If you can’t answer what the project will do for the business, you may have forgotten the most important process: creating a Business Case. It’s surprising how many projects go without one. Less surprising is how many of these projects fail to create value for the business. For example, if you’re developing a new technology, can you prove that it will be on the market and in demand? A lot of businesses invest in projects because of how exciting, and not how beneficial, they are. This is a common problem for inexperienced project managers who want to play it safe. Try not to dwell on getting the processes right according to the Managing Successful Projects guide. Some processes are alien or disruptive to individuals or groups. A good Practitioner will tailor PRINCE2 to the environment. Also create an atmosphere for listening when people struggle with processes. There’s also a tendency to think of roles as interchangeable. Remember that certain people are better at certain things. If someone’s being pulled from your project, point out what that person is needed for and ask for a replacement. Constant turnover, or talent churn, is even worse. The sense of ownership and historical knowledge of the project gets diluted every time a role is refilled. What if you have one vendor and something falls through, like a new sales tax that inflates the cost of your supply? It’s possible that you noted this in the Risk Register and decided to order your supplies well ahead of time, just in case. If not, consider adding multiple suppliers to Product Descriptions. With no backup plan, your project is always in a precarious position. The worst part is, a point of failure can be external. But it still becomes your problem and you will need to somehow rectify it. Unfortunately, you might not always have the time or budget for backup vendors or any backup plan at all. For example, you could run a project on a government contract and they might decide one day that they don’t have the budget to continue and the project is cancelled. So while you can mitigate risk, you can’t eliminate it. Sometimes, companies bring in project managers and the employees are hostile to the new processes and technologies they introduce. Other times, they’re worried about being moved around or fired outright. A hostile workforce isn’t like scope creep. It makes itself obvious early on in a project. Look out for passive-aggressive behaviour and people who continually question your ability. Even when stakeholders aren’t actively hostile, they can still be disinterested. This is especially common with sponsors. Unlike team members, they can drop money for a project and then back off. We previously talked about what sponsors can bring to a project. It’s no surprise that engaged sponsors are a strong indicator of project success. You can turn a lot of disinterested stakeholders around by courting frequent feedback from them. If they’re actively hostile however, you’re better off avoiding the project unless it’s essential to your career. So it seems project management takes more than common sense and instinct. But if PRINCE2 sounds too restrictive out of the box, then you’ll like the latest 2017 update. It makes PRINCE2 easier to tailor, especially for Agile. There’s also a dedicated PRINCE2 Agile course. If you have any questions about PRINCE2 training, you can contact us here.